I have stumbled across my fair share of videos that bring me to aca (audible chuckle achieved – it’s a manlier way of saying lol) Some of them are intentionally funny and some aren’t. But either way, here is my list of ridiculous security videos. This one would make a good unaired Dominoes commercial, you know, one of those ones they post as a leaked commercial but they meant for it to get leaked the whole time. Kind of like but completely different than those Paris Hilton tapes. More like the banned skittles commercial. (8/10) It’s like we all know you made the video to post online. You leaked it yourself under the title leaked video. Then like 5 million more people watched it than would have originally. So… actually that’s a pretty good move. Seeing as how I don’t watch TV any ways and only aimlessly watch netflix instant and youtube video, touche … whoever did that. Touche. Now let’s take a look at the opposite of a good marketing move. When Brinks turned into Broadview they released a fairly embarrassing line of commercials that enticed a lot of criticism. In this world, in an obvious attempt to stay faaaaaaaaar away from even the vague smell of race related questions, they only exhibit white people robbing white people. Here is one of the actual commercials. Now, here is a commercial making fun of that. She then proceeds to calll the authorities, claims he looks like O.J. She sits terrified cluthing the phone until we hear the authories gun him down in a bloody, what we can only presume, hail of gunfire. She moves to her couch as ominous dark tones audibly creep into the scene or presumed terror. They were also bad enough to make SNL. So here is that. “Are you a single woman who lives alone in a large 5 person house, then you need Broadview Security. Then there is this video by Security Officer Jay which I thought was fake, but no… there is actually a website where you can buy the CD. If you made it to the end, then here is a compilation of the world’s dumbest criminals caught on tape. Now, it might be a little disheartening to see how many of them have allegedly not been caught but that’s another story. 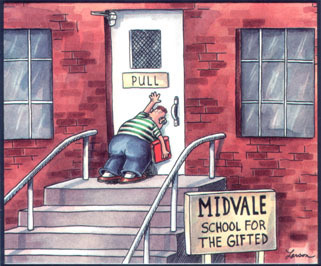 So, I’ll leave you with this illustration that I’m reminded of from my Gary Larson calendar when I was a kid. Dylan Johnson is a photographer and creative director at Security Options in Oklaoma City, OK. He writes about home security related technology.